Featuring a high contrast Green Emerald PHANTOM lens with a tint that changes with the light from cat.1 to cat.3, the Bollé Nevada PHANTOM gives superior optical clarity and enhanced vision whatever the conditions. This cylindrical frameless goggle is a big hit with Team Bollé athletes including Dave Ryding. We love the look of this goggle and the addition of the PHANTOM lens provides an impeccable visual experience. This is a goggle packed with high tech features, making it the perfect combination of style and performance. 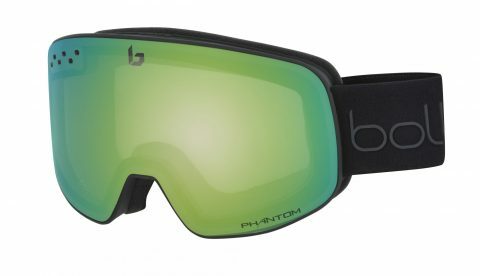 The Nevada Phantom lens have a double lens, which creates a thermal barrier between the cold-dry air outside on the mountain and the moisture inside the goggle. This prevents the formation of pesky condensation, while an anti-fog treatment is also in action to ensure no fogging either. Flow-tech venting promotes directional airflow across the inner lens, which further reduces the potential build up of moisture. On the outside of the lens, Carbo-Glas Anti-Scratch technology means you can be safe in the knowledge that your lenses are highly protected, reducing scratching and keeping your visuals crystal clear. Of course, the lenses also contain Bollé’s high levels of UVA/UVB protection, blocking rays up to 400 nanometers.